Eating turkey is part of the Thanksgiving tradition. The definition of a tradition is a custom or belief that is passed down through the generations or that is done time after time or year after year. 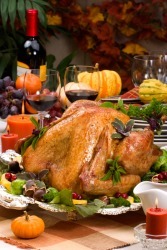 An example of a tradition is eating turkey on Thanksgiving or putting up a tree on Christmas. "tradition." YourDictionary, n.d. Web. 22 April 2019. <https://www.yourdictionary.com/Tradition>. The passing down of elements of a culture from generation to generation, especially by oral communication: cultural practices that are preserved by tradition. a. A mode of thought or behavior followed by a people continuously from generation to generation; a custom or usage: the traditions of Tibetan Buddhism. b. A set of such customs and usages viewed as a coherent body of precedents influencing the present: followed family tradition in dress and manners. See Synonyms at heritage. A precept or a body of precepts that are not written in the sacred book of a religion, such as the Bible, but are considered holy or true. A style or method of an activity or practice, especially of artistic expression, that is recognized and sometimes imitated: satire in the tradition of Jonathan Swift. Middle English tradicioun from Old French from Latin trāditiō trāditiōn- from trāditus past participle of trādere to hand over, deliver, entrust trā-, trāns- trans- dare to give ; see dō- in Indo-European roots. A part of culture that is passed from person to person or generation to generation, possibly differing in detail from family to family, such as the way to celebrate holidays. The act of delivering into the hands of another; delivery. (obsolete) To transmit by way of tradition; to hand down. From Latin trÄditiÅ, from the verb trÄdere. It's a tradition around here. Our family has a long tradition of self-sacrifice and charity. Maybe we should start the tradition again. For once, just follow tradition and look like a normal bride.